Located at the intersection of Highways A and E, you will find this cozy little train stop pretty much at the Peninsula center. Great place! 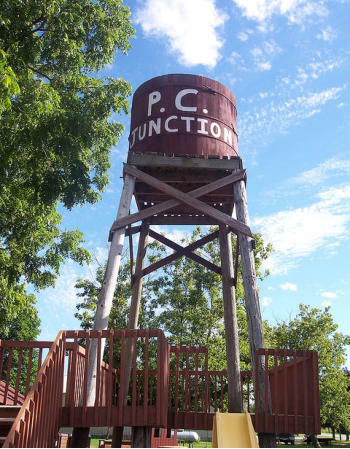 If heading north on Hwy 42 through Egg Harbor, take a right on E and go until the stop sign at A - and you will arrive at the station - at PC Junction - at the peninsula center, so PC! This is a great find for the family! This is a place kids will love for lunch. You can get sandwiches, burgers, chili, etc. here. I've had bbq beef, and a lot of other things here - all good! We have taken many people here of all ages, and everyone loved it! If you cannot get a table right away, you can wait at the outdoor bar (the Libation Station) - where you will find a pool table all in the open air, but sheltered from the elements with a roof and open walls . This is fun too - we had a great time waiting! Or you can elect to eat at the covered porch area added in Spring 2007 and eat al fresco (no train, but fun). And PC Junction has a full liquor license, so you adults can get what you want like Bloody Marys or Margaritas. Denise and Bill keep thinking of innovative ways to make PC Junction better and better! There are lots of things for kids to do while the family is waiting to dine at PC Junction, like a huge chess board outdoors, a "paint the family" board and the populat pig, Rosie the Pig! If you want some pizza, soup, award-winning chili or dessert, PC Junction has added a new barn, the Pizza Czar, out back that serves up yummy treats on their new line! And Friday fish frys too served in the main building 5-8PM. Another cool addition! If you can, wait for seats at the counter, which is made up of old doors. Order your food from a server, and wait. They have great food and great root beer too. The engineer in the kitchen, visible through the opening in the wall, will cook up your order and load it aboard a train. When you hear a train whistle, and the server call your station ("Next stop, Baileys Harbor!" you know your food is about to be delivered - by train! And once in a while their new "bubble train" will make a run around the tracks spewing fun bubbles out into the air! Othertimes the train will carry stuffed animal passengers around the track. Bring the camera - this is fun! You will want to take some pictures of your party at this unique "whistle stop!" All aboard! Don't miss this train at PC Junction! And pssst: if you want to really be in the know, then you have to know what PC stands for! Peninsula Center (shhhhh)! And tell them that DoorCountyNavigator.com sent you - that way YOU can help keep this site alive and well for you! Thanks!